This game will not work on your operating system. Are you sure you want to download this game? Buy Now Get the full version70% OFF! Are you sure you want to purchase it? Eipix Entertainment proudly presents another swashbuckling tale in the Sea of Lies series! The dastardly Pirate King is out for blood, and you’re his next target! The infamous pirate has a plan to kidnap you to get revenge against your father. But his plans go awry when the captain he sends to nab you sets you loose instead! Now you find yourself on a mysterious island full of pirates with the only key that can stop the Pirate King. But who can you trust? 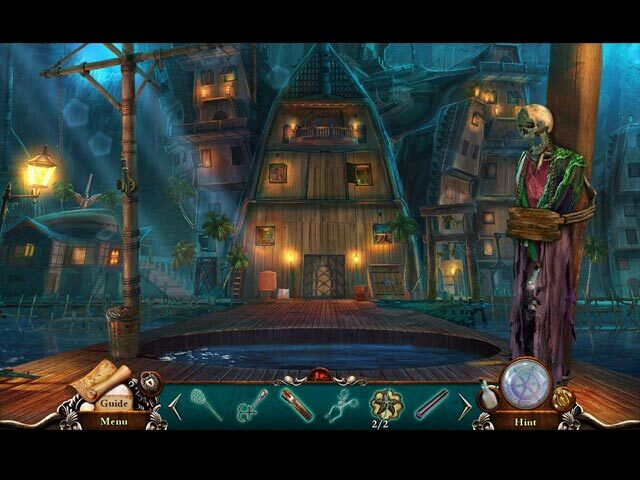 The only way to find out is to go undercover as one of them and use your wits to guide you in this swashbuckling hidden-object puzzle adventure game! * Collector's Editions and free to play games not included. Sea of Lies: Leviathan Reef is rated 4.1 out of 5 by 14. Rated 5 out of 5 by jessickamckenzie from Where has this beauty been hiding?? Absolutely loved everything about this game. I haven't found a good pirate series since Nightmares from the Deep. I have yet to play the others in this series, I am so hopeful that they are just as awesome as this one. Love Eipix! Rated 5 out of 5 by CornishPyrate from Dive in to defeat the Pirate King! This is another great EPIX game. They have turned out so many good ones I always expect a good adventure when new one comes out and worth playing over. Beautiful graphics. Story line is not confusing. I count this as moderate skill level because I didn't have much trouble with the clues. This kept the game going and my interest peeked. It was hard to put away once I started it. Conversations are not overly wordy with just the right amount of flavor to give you the points and move on. Rated 5 out of 5 by biscuitsmama from YO-HO-HO ITS A PIRATES LIFE FOR ME You play the game as the daughter of the governor of an island in the West Indies who has finally come to visit your father after the passing of your mother. Unfortunately, you are kidnapped just as you arrive, separating you from your father and putting you into the perilous situation of walking the line between warring factions. There is the Pirate King, who rather resembles the fabled Blackbeard, and others who are bent on destroying him. Shortly after your capture you find an unlikely ally in the ship’s captain who helps you escape and starts you on your adventure. The gameplay modes include the custom setting where you can select your hint and skip times as well as a few other options. The graphics are absolutely top-notch create the pirates’ island haven to perfection. The HOS are familiar and what we normally see from this developer. In the demo I only saw one scene where we must find five each of two different items to open the list – a mechanism that has been quite overused. One HOP scene I really liked is where I had to find clothes so that I could camouflage myself as a pirate. Several of the HOS were multi-level and even though they are familiar were enjoyable. The mini-games were good as well and include finding symbols to open a box, place statues in the proper position by moving their limbs, find your way through the jungle by using a map, place weights to position a bridge, and others that are fairly simple. My favorite mini-game was a slider puzzle that requires removing the sliders in the correct order to open a path. All in all even though there were not any difficult mini-games I still found them fun to solve. The CE version includes the following extras: 41 messages in a bottle, 6 chests, and 25 souvenirs to find after you complete the main and bonus games. Morphing objects can be found in the HOP scenes so keep your eyes open to see if you can spot them. Of course you can earn achievements as you play through the game. Other extras include the Strategy Guide, Replay of HOPS and Puzzles, Music, Video, Pictures, and a Souvenir Room. There is also a tribute video for the series that will highlight scenes from all Sea of Lies games. The Sea of Lies series is not my favorite and I although I was rather ho-hum about this game in the beginning it did become much better and I was quite surprised. Leviathan Reef is the final game in the Sea of Lies series and at least it is sailing into the sunset with flair. In the end, I did quite enjoy the game and it was excellent. The mini-games were much better than usual and the HOPS were well-crafted. If you enjoy pirate games, then Leviathan Reef is a great 5-star game to add to your collection. Rated 5 out of 5 by skullfun from SHIVER ME TIMBERS! SEA OF LIES 6 WAS INCREDIBLE... Within the peaceful West Indies, a growing threat appeared. From the remnants of scattered swashbucklers a powerful force rises know as The Pirate King. In this game you play as a governor's daughter who has been kidnapped by the order of the infamous evil Pirate King. While he thinks that his evil intentions are being carried our by this group, there is actually a plot against him, and you are in the middle of it. The pirates who kidnapped you let you live, but leave you on an island full of pirates. Now you really need to be smart and witty to pretend to be one of them and help destroy the Pirate King. It is a fantastic pirate story with a lot of interesting characters. GOLD TEETH, NO FINGERS (the mechanic who builds the indestructible Waverunner ship) TERESA 'LA TORMENTA GARCIA and her brother SKYTE, and BARTHOLOMEW ROUS (the shaman pirate). You get to meet all kinds of personas, but you can not trust them all. During your journey you are assisted by colonists Bowen and Amara who help you learn for yourself who to trust and why the Pirate King is collecting Souls. I was fascinated by this exceptional Pirate tell and very impressed with the superior graphics, sound/SFX, Voices, and soundtrack. Then there is a bonus game in the CE version where you play a bit more discovering the history of the pirate's curse. The visuals of this game are absolutely wonderful - the depth of the sea or the ship cabins look great. The game is available in four modes of difficulty: Easy, Medium, Hard, and Custom. The hints (10-120 seconds) and skips (10-400 seconds) are adjustable as you would expect from this kind of game. A map is provided as you play as well as a strategy guide if you usually use one of those. Most of the game play seems to be quite easy. The hidden object scenes are going to feel quite familiar for those who have played any of the series' games before. 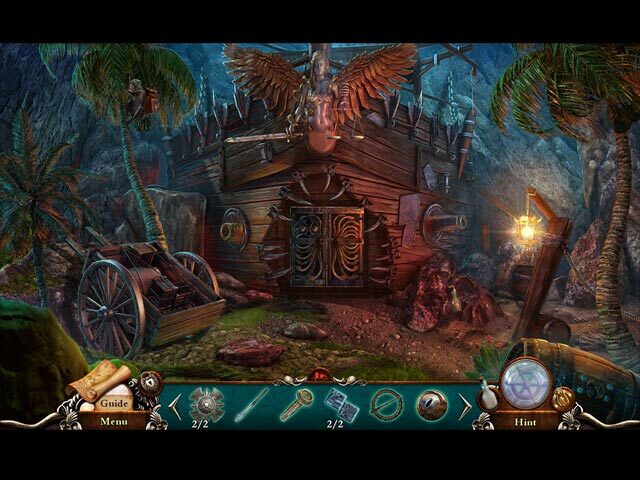 You have a Match 3 if you are not in the mood for hidden objects. You still need to be on the look out for morphing objects, though. The puzzles differ in their type and difficulty. Both HOP scenes (18) and puzzles (25) are up for replay. You get to earn 17 achievements and collect messages in the bottle and chests. You can not only replay some of the game but also enjoy some of its media (concept art, wallpaper, videos etc...) once you are done with it. Eipix as the representative of the next-generation of casual Adventure games, Sea of Lies: Leviathan Reef Collector’s Edition and Standard Edition contains unmatched video cut scenes and will keep you overjoyed from starting to finale. What a finale it is too. I will miss this series, but know that Big Fish and Eipix are busy continuing creating New Worlds for game club members! Rated 5 out of 5 by charlene_lane from DEFEAT THE PIRATE KING - GREAT GAME REVIEW FROM COMPLETED GAME AND BONUS This game is fabulous and so worth playing. There is: * Voiceovers (with dialogue); * Easy, Medium, Hard and Custom modes; * Interactive map; * Play Match 3 instead of HOPs. In Custom mode you can turn off what you want (like Hint and Skip to make it more challenging) and leave in what you do like (like areas of interest in the interactive map). I love this function because I like a challenge and can turn everything off. That's probably why it always takes me more than 10 hours to play a game! The graphics are superb - colourful and well defined. Its easy to find everything you need because the scenes are crisp and well drawn. Sound is good. The music is fast orchestral which I had on loud throughout the game. 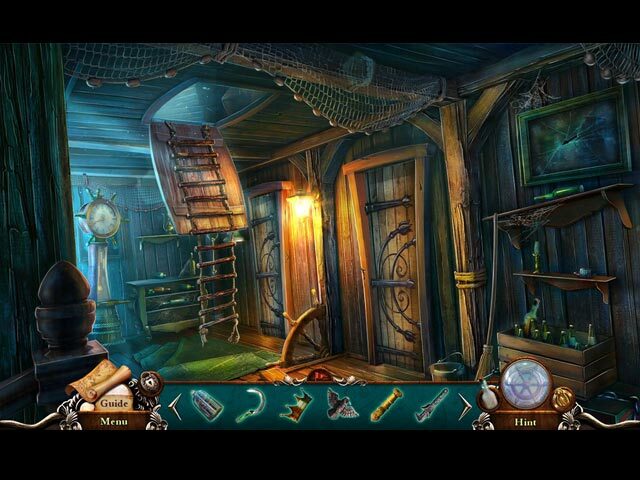 The hidden object games have a great variety. These are interactive straightforward, silhouette, find items and unlock keys and two silhouette pictures where you need to find the item (for example a paw and fish = cat). These had a really good challenge to them. There is also one morphing object per HOP which morph quite slowly. You can also play Match 3 if you fancy a change from HOPs. There are a huge range of mini-games to play, ranging from easy to very hard. There are games in there for everyone's taste. A few of them took me ages to conquer. So, do you get the CE or SE? In the CE you have 41 bottles to find throughout the game and bonus. There is of course Achievements and in the Extras you can replay the mini-games and HOPs, find 25 souvenirs in the Souvenir Room as well as all the other usual extras that we get. Whether you get the CE or SE you will enjoy the fast pace adventure with plenty to do. Definitely recommended. Happy playing fishies. Rated 4 out of 5 by ninja226 from shiver me timbers I'm glad I stuck it out with this game. It started out really slow and not intuitive at all as to how to proceed. It got much better as you make your way onto the ship. This is a long game to play, with more puzzles than HOS, the latter being quite varied and thought provoking instead of the ho hum list of objects in every junk pile. The map I am not too crazy about (too cryptic for my taste). The artwork is good, but short of high def and therefore, not exceptional, in my book. The story is forgettable for me, but overall game experience is above average and worth a buy. Rated 4 out of 5 by SophieRoxy100 from Have played twice enjoyed just as much Great storyline. Fun graphics. Story really moved around well. Lots of different scenes. Easy to see. Nice challenge. Rated 4 out of 5 by pennmom36 from Shiver Me Timbers Mates That Dastardly Pirate King Is Up To No Good! Remember how exciting the very first Sea of Lies game was. The storyline was so different than all of the other games, and took place either at sea or on the coastline with lots of pirates and seafaring mates. The dialect was convincing as was the time period props and wardrobe. I really thought this series was going to be one of my all time favorites, however, Sea of Lies was releasing a new game every time you'd turn around it seemed like, and I began to notice a change. Sea of Lies distanced themselves away from the one thing that set this series apart from all the other genre's, the Pirates! They weren't about treachery and mutiny on the high seas, nobody walked the plank, why? Because there was no plank to walk, most of the games weren't even taking place on a ship, some barely mentioned a ship and even then, there were no pirates. Finally! 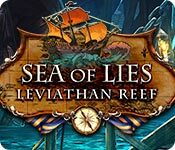 I think Leviathan Reef will be Sea of Lies' saving grace, with it's beautiful graphics and fantastic pirate flare, I'm not going to complain about a single thing! The Collector's Edition version has 41 Hidden Messages in a Bottle, and some of the scenes have a Morphing Object as indicated by the icons above the inventory bar, features I happen to love so I personally prefer the Collector's Edition over this Standard Edition. The Hidden Object Scenes vary with just about every style, Interactive List Finds, Progressive Interactive, Silhouetted Shapes and even Sketches, my favorite takes place on the shoreline where you are tasked with finding multiples of each item, new items wash onto the shore with each ebb of the tide, pretty creative if you ask me. The Mini Games are all pirate themed or nautical themed as well, rotating tokens until all images are in their correct habitat or swapping tiles to complete a pirates map. The Collector's Edition has 18 replayable Hidden Object Scenes, 25 replayable Puzzles, replayable Match 3 games, 14 Wallpapers, 14 Concept Art pictures, 41 Hidden Messages in a Bottle, 17 Achievements, 9 Music Soundtracks, 9 Videos, a Tribute Video, a Souvenir Room, 18 Morphing Objects, a built in Strategy Guide and a Bonus Chapter, enjoy all ye scallywags! Rated 4 out of 5 by alowan from Tortuga is definitely not a torture! While it didn't "blow me down," this is a good game. It's not written by Rafael Sabatini, but looks like a good pirate story, and with some of the supernatural added, well, shiver me timbers. There is the typical "Here's a place - it has several things to unlock or add missing pieces to - wander around picking up pieces - each of those spots has missing bits too" game play. I only have one more gripe, and that is the (also usual) being unable to use something in the inventory except on one item. How I wish they would start us out with a multi-tool, and let us keep and use it til the end! I very much like the non-standard HOPs. (The usual list/interactive ones are there, too.) I also enjoyed the puzzles. I usually skip them in a demo, but not this time. They seem to play to my strengths. The graphics are superb. I never met such a cute bunch of pirates in my life - except the evil Captain! I'll be diggin' into me shrinkin' pile o' Pieces of Eight. It's a keeper! Quality tested and virus free. No ads, no adware, no spyware. Check us out on: FacebookTwitterYouTubeFollow us on Pinterest. © 2019, Big Fish Games, Inc. All other trademarks, registered trademarks, or logos are the property of their respective owners. We're sorry, but you do not currently meet the eligibility requirements to create a Big Fish account. Please contact Customer Support if you have any questions. Sign in or create an account. Your username will be displayed on your review. Pick a username you like and can share with others. Your username is permanent and yours forever. Enter the email address you use for your Big Fish account. We’ll email you a temporary password. Need help? , share your thoughts about this game! The dastardly Pirate King is out for blood... and you're his next target! Heres what your review will look like once it’s posted. Click Submit if you’re happy. Your review should appear soon. To make changes, use the Edit or Cancel buttons. Thanks for sharing your thoughts about this game! You’ve already shared your thoughts about this game. Thanks for submitting the review below.